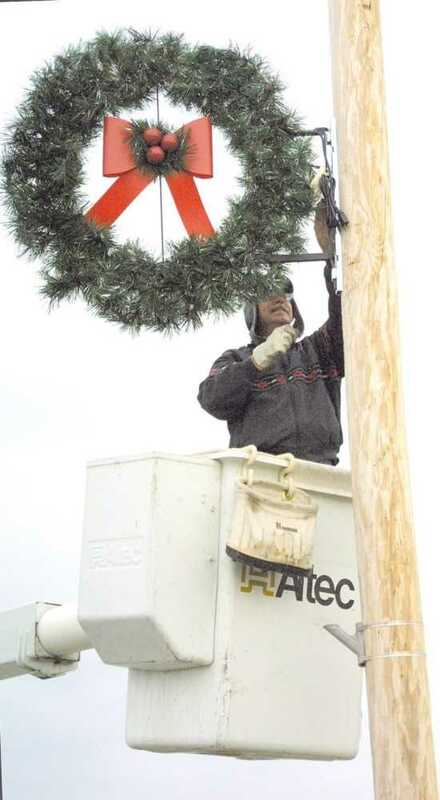 Bill Baumbach hangs one of Indianola's new Christmas wreaths from a light pole on Highway 6&34. Helping on the ground is James Blume. The wreaths are new -- replacing the holiday decorations the community's Mrs. XJaycees stored in the city building, which burned to the ground in March. Insurance money replaced the decorations for the poles on the highway and the strings of lights that will zig-zag back-and-forth across Main Street. City Clerk Ona Malleck said Work Ethic Camp offenders will help hang the Main Street lights because, she said, that chore requires 12 to 15 people to hold up strings, screw in light bulbs and attach the strands to power poles. Those zig-zag strands were just a year old when they were destroyed in the building fire.